This was ‘I don’t know where the day has gone and I haven’t planned dinner kind of meal’. In fact I raided the fridge in desperation only to find cauliflower, spinach leaves and cheddar cheese to work with. (I always try to buy vegetables in season and cauliflower is superb at the moment). As a self confessed foodie I can’t bring myself to buy anything ready made, it just goes against the grain, truthfully I actually get a kick out of creating something from nothing. 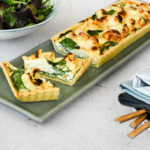 Now that wild garlic is in season I’ll be substituting the spinach for the seasonal leaves, I think the combination works so well. If you find yourself at Marlow market on Saturday, I’ll be selling it with a seasonal salad. In the bowl of a food processor place the flour, butter and salt, pulse until it resembles breadcrumbs, add the cold water and pulse until a dough is formed. Removed from the bowl and roll into a ball and flatten wrap and refrigerate for 30 minutes. Pre-heat the oven to 180°C. Lightly grease a 11 x 34 x 2.5 cm or 28cm round fluted rectangular loose bottomed tin. Line the case with the chilled pastry leaving an overhang. Line with baking beans and bake for 15 minutes, remove the beans and bake for a further 5 -10 minutes or until the pastry is dry and just turning golden. Cool a little. Trim the excess pastry with a microplane. For the cauliflower filling cook the cauliflower in a saucepan of boiling salted water for 3 to 4 minutes until tender. Drain, keeping 30mls of water for the cheese sauce. Heat the milk and cauliflower water in a small saucepan over medium heat until hot. Melt the butter in another saucepan over medium heat, stir in the flour and cook for a couple of minutes. Gradually whisk in the hot milk and stir until it reaches simmering point. Simmer for 10 minutes before adding the cheese. Add the grated cheese and mustard, season well with salt and pepper. Placed the cauliflower in an oven proof dish, pour over the cheese sauce and bake at 180°C for approximately 15 to 20 minutes or until golden brown. Remove from the oven and cool. Crack the eggs in a bowl with the egg yolk, whisk briefly and add the milk, salt, pepper and nutmeg, whisk again. 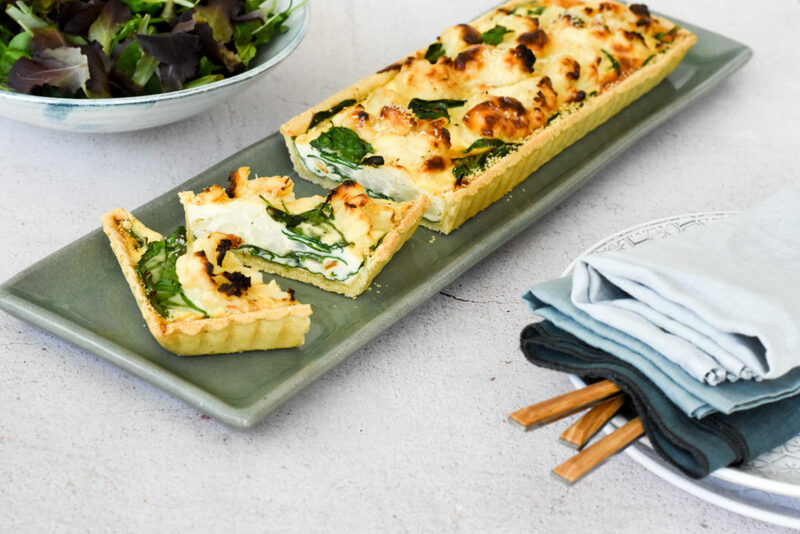 To assemble: Scatter the spinach in the pastry case then nestle the cauliflower cheese among the spinach leaves and sprinkle with Parmesan. Pour in as much of the custard filling as you can without spilling. Return to the oven and bake for a further 25 to 30 minutes or until the past it has it and is golden brown.